I have been cranky this summer. Too much heat, work, and ridiculous politics. Not enough rest, reading, and picnics. I find myself replaying yesterday’s bad mood or anticipating a snow day in some relaxing future. It is easy to get preoccupied backwards and forwards, the present seems a jam packed to-list and those people that when merging lanes, rush alongside your car and cut in when you have waited patiently in queue. Even the popcorn movies have been gloomy. I was about to chalk this summer up to a dead yard and frizzy hair when I got a hold of myself. The present is filled with moments worth considering. I just haven’t been paying attention. 1. Queen Anne ’s lace flowers by the side of the road while driving to work. They look like floating doilies or small galaxies of stars or some weird herb gone to seed. The metaphor possibilities are endless. 2. A random fire alarm that reduced a 2 ½ hour conference call by one whole glorious hour. 1 hour saved – 20 min of standing in the parking lot = 40 minutes of found time. 3. Pasta smothered in more mizithra cheese and browned butter than is respectable for a woman of my age (or any age that requires a beating heart). 4. Attending a teenage community theater production and watching this big, awkward kid that the audience dismissed as comic relief . . . completely surprise and blow their minds with his amazing voice and presence. 5. This picture. Note the very handsome activist three signs from the right. #5! #5! His activism makes him even more handsome. 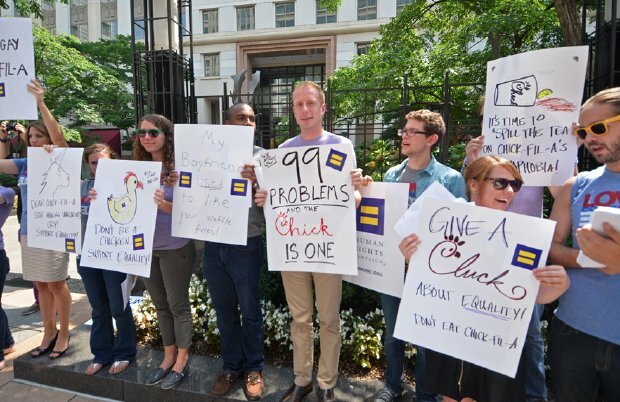 I got into a couple of small arguments on the internets yesterday about Chick-fil-A and was apparently wrong. 1) Woke up half an hour before alarm, not tired. 2) The cat was in a friendly mood and we spent a while lying around talking of this and that. 3) They had the cauliflower soup at the lunch place. 4) The Friday Times puzzle is the ideal difficulty level: challenging but not insane. Somehow I just knew right off the bat what “1984 film based on the 1924 novel” was. 5) The boss has gone home and so might I, to regroup a little and head back out for quality time with your regular Thursday blogger. LP, I am so proud!!! FPS, I love your list. Especially #4, a little smart goes a long way. I thought I had the answer but got it wrong by a year. Drat. Will have to think longer than off the bat. Please tell your blogger hello!